The power that destroyed the volcano belongs. Most civilizations the world has ever lost due to a volcanic eruption many-fold strength compared to the enormity of the eruption of Mount Merapi. Merapi, which has killed more than 100 people have made us weep since Tuesday (10/26/2010). "The Year Without a Summer". That's what happens when on a Monday, April 10, 1815, Mount Tambora in Kabupaten Bima, West Nusa Tenggara, launched the pyroclastic material. Pyroclastic rocks 2-15 cm in diameter ejected as far as 40 kilometers. The eruption lasted eight days, 5 April-12 April, with a peak on April 10, spewing out 150 billion cubic meters of pyroclastic material. What remains after that is 92 000 people were found dead and about 80,000 people still living, the Kingdom of Concentration and the Kingdom of Tambora on Sumbawa Island disappeared were buried, and the earth's temperature fell by more than two degrees Celsius (about 5 degrees Fahrenheit). Snow fell in June in Quebec City, Canada, crops in many parts of the world crop failure. Historian John Post called it, "the last great crisis in the Western world." From the book Bernice de Jong Boers, Mount Tambora in 1815: A Volcanic Eruption in Indonesia and Its Aftermath, cracking noise was heard in Bangka Island (about 1,500 km away), Bengkulu (1775 km), and the sky above the Madura (500 km) dark for three days. The peak of Mount Tambora cut 1,400 meters high which will leave 2,800 meters. "Beep bahananya very berjabuh / bucket of water taken Habu / Shouting call the child and mother / thinks the world became gray." That eruption in modern history of human terdahsyat. 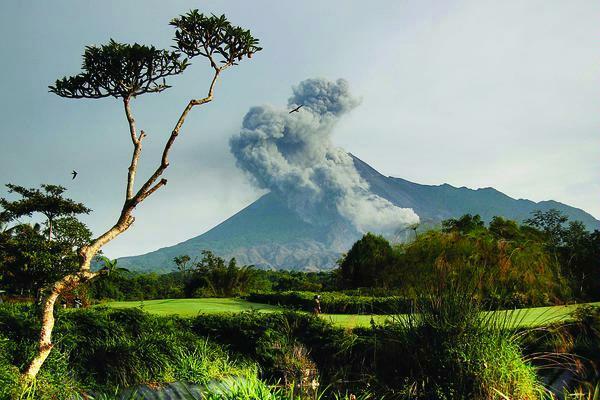 Its strength reached about Volcanic Explosivity Index (VEI) 7 maximum VEI of 8. This index is analogous to the magnitude of the earthquake that expressed by the Richter scale. 8 VEI scale explosion occurred at Toba super volcano at 73,000 years ago which led to the formation of Lake Toba with a diameter of 3,000 km. Terdahsyat volcanic eruptions in the world number two still held by the mountain located in the archipelago, namely Mount Krakatoa, Mount Anak Krakatau is not present in the alert status. On August 27, 1883, Monday, Mount Krakatoa erupted with force VEI 6, which triggered a tsunami as high as about 50 meters. A ship is 80 kilometers was hit by a gust of wind hurled the eruption. Krakatau dust floating around the world for two weeks. The world was dark. For years the effect is still felt, causing sunlight to be different that inspired poets West. One is the work of the Norwegian poet, "The Scream", which inspired the effect of Krakatau. Krakatoa volcanic dust dispersion pattern has helped the understanding of global wind currents. The peak of Mount Krakatoa disappeared and "born" Mount Anak Krakatau. The 20th century arrived. History of a huge volcanic eruption is the third largest recorded eruption Novarupta which erupted on Thursday, June 6, 1912, with the strength of VEI 6. Pyroclastic material "sucked" from the Mount Katmai, a distance of about 10 km from Novarupta. Katmai caldera and then lived to be about 3 kilometers in diameter, with a depth of about 265 meters. The Philippines is host to the mountain with the fourth eruption terdahsyat. Saturday, June 15, 1991, the mountain is located near the U.S. naval base at Subic Bay, Luzon Island, Philippines, erupted and caused 850 people died and 66,000 people were evacuated. Global temperature went down 3 degrees Celsius and during the next three years will be lower 1 degree Celsius or rose two degrees Celsius compared pascaletusan. Pyroclastic dust that spewed out reach 5 billion cubic meters. Pascaletusan, the U.S. Navy base at Subic Bay was closed. Pinatubo eruption is the first after about 500 years the mountain was detected dormant (sleeping). The eruption was exacerbated by the hurricanes which hit the Philippines Yunya at the same time. The rest we can talk about the eruption of Mount Pelee which cost the lives of 30,000 people (the largest at the 20th century). Type eruptions became the basis for setting the type of volcano eruption. Do not also forget, centuries earlier, the eruption of Mount Vesuvius in Italy has buried the civilization of the city of Pompeii.